We are probably not unique this time of year whereas we are sitting on a bunch of tomatoes. I’ll admit that my wife loves tomatoes a lot more than I do, but when they are hanging from the vine or loaded in a bowl on my counter from a recent harvest, well I’m about to do something about it. That’s when I typically think about harvesting the rest of our basil from outdoors and making a fresh sauce to be used on pizzas or lightly tossed with some pasta, but this time around I decided to take a generous handful of tomatoes and slowly roast them. Why? Well, because I had some great day old bread on the counter, fresh tomatoes, and fresh basil, and that screamed one thing and one thing only. Roasted tomato crostini. This is a super simple recipe to make, can feed a crowd, and is really delicious especially with the roasted tomatoes. During this time, slice the bread. 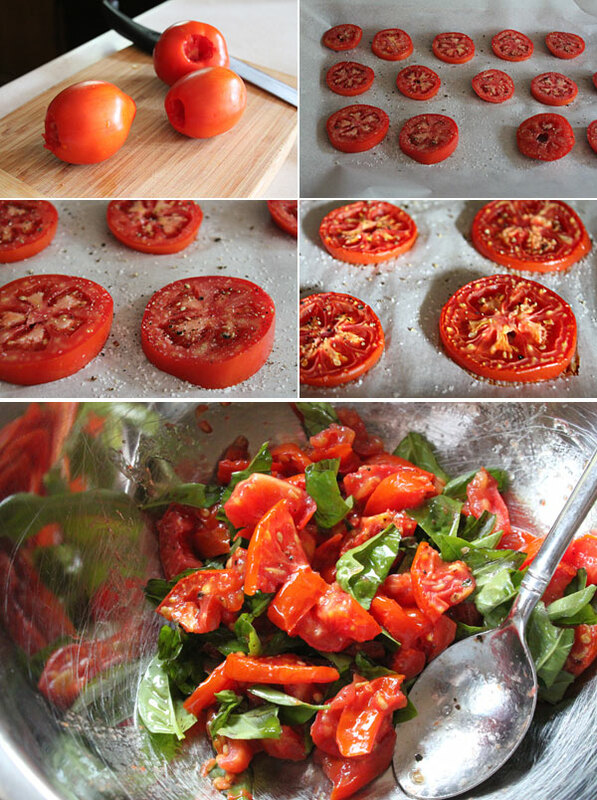 Remove the tomatoes, and let them cool. Add the bread to the oven, and cook just until lightly crisped. Take the bread out and rub each piece of the bread with the garlic clove. Chop up the cooled tomatoes, and add to a bowl with the freshly torn basil. Add in the olive oil and gently stir. 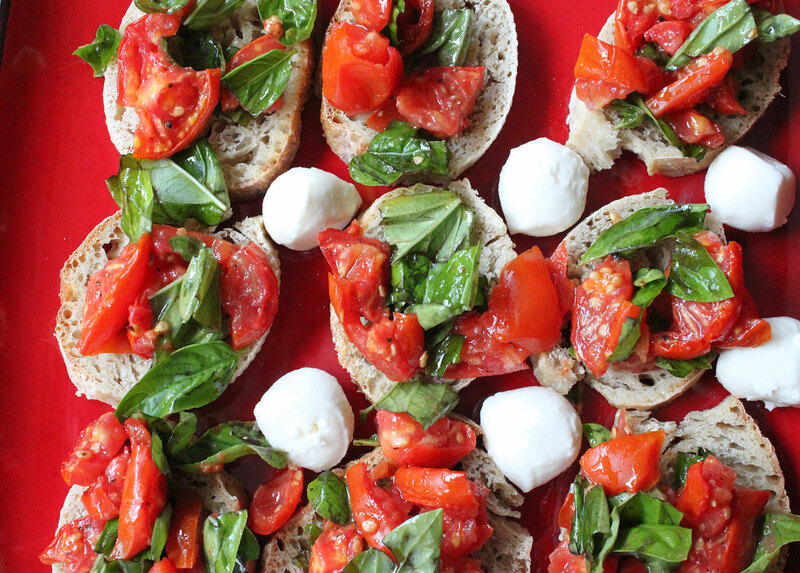 Lay out your bread onto a serving tray, and spoon on the tomato and basil mixture. Add the mozzarella balls in between some of the crostini for those that want to add a bit of cheese to their bite. Dig in and enjoy. 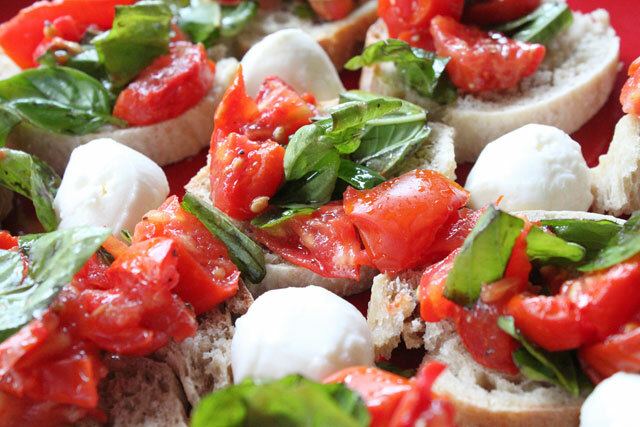 That lightly toasted garlic bread topped with fresh basil and roasted tomatoes really make this a perfect bite for any occasion. Hope you enjoy!